Australia’s Foreign Aid Dilemma tells the story of the actors who have grappled with this question over 40 years. It draws on extensive interviews and archival material to uncover how 'court politics' shapes both aid policy and administration. The lesson for scholars and practitioners is that any holistic understanding of the development enterprise must account for the complex relationship between the aid program of individual governments and the domestic political and bureaucratic contexts in which it is embedded. If the way funding is administered shapes development outcomes, then understanding the 'court politics' of aid matters. This comprehensive text will be of considerable interest to scholars and students of politics and foreign policy as well as development professionals in Australia and across the world. 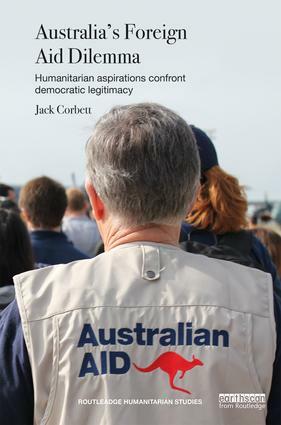 Jack Corbett is Associate Professor of Politics at the University of Southampton, UK; Honorary Associate Professor at the Australian National University’s Coral Bell School of Asia Pacific Affairs; and Adjunct Senior Research Fellow at the Centre for Governance and Public Policy, Griffith University, Australia. The Routledge Humanitarian Studies series in collaboration with the International Humanitarian Studies Association (IHSA) takes a comprehensive approach to the growing field of expertise that is humanitarian studies. This field is concerned with humanitarian crises caused by natural disaster, conflict or political instability and deals with the study of how humanitarian crises evolve, how they affect people and their institutions and societies, and the responses they trigger. We invite book proposals that address, amongst other topics, questions of aid delivery, institutional aspects of service provision, the dynamics of rebel wars, state building after war, the international architecture of peacekeeping, the ways in which ordinary people continue to make a living throughout crises, and the effect of crises on gender relations. This interdisciplinary series draws on and is relevant to a range of disciplines, including development studies, international relations, international law, anthropology, peace and conflict studies, public health and migration studies.